Summer days so searing you can scarcely breathe when you step outside. We’ve had several of those already this summer! Even being inside where it is cool can just sap energy. 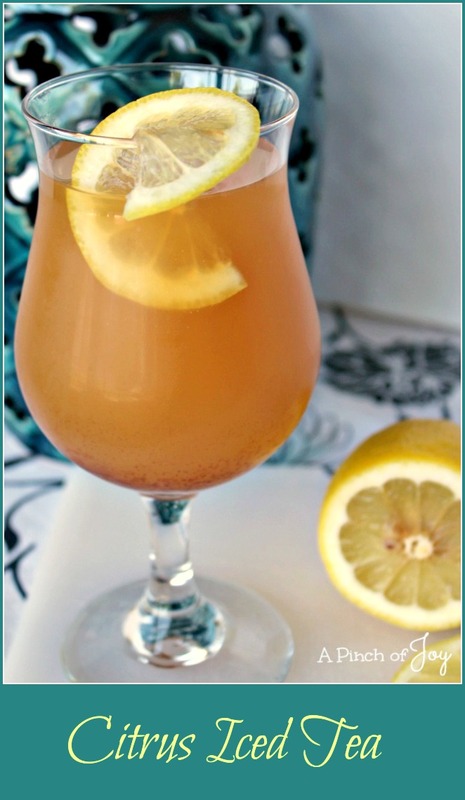 Citrus Iced Tea is so refreshing on those kinds of days! It’s not sweet nor tart – just a balanced blend of tea and citrus that will restore your energy and goodwill. Garnish with a thin and colorful slice of lemon or orange and maybe a sprig of mint to make it pretty to lift your spirits, too. It’s unique flavor is perfect for just warm days, too. In fact, its hint of spiced citrus is good anytime you want a change of pace, for yourself or a gathering of friends and family. Make ahead of time so the flavors have time to meld – so worth the advance planning. I’m known for last minute creations, but this one really does need time to develop fully. You might want to make two batches so there is one ready to drink while you make a replacement for the first. 🙂 Heating the spices enhances their flavor. I pour the drink from the gallon jar into a pitcher to serve. Usually the cinnamon sticks stays in the bottom of the jar and I scoop any cloves out of the pitcher before serving. The spice should barely be noticeable, just enough to keep people guessing why this drink is so different and soo good. Mix lemonade concentrate, orange juice and 2 quarts of cold water in a gallon jar. Measure additional 4 cups (1quart) of water in medium saucepan and place over medium heat. Slightly crush cloves with fingers and add cloves and cinnamon stick to water. Add sugar and stir until dissolved. When water comes to boil, turn off heat and add tea bags. Let steep for about 15 minutes. Remove and discard tea bags, but leave spices. Mix tea into lemonade mixture. Refrigerate covered for 2-3 hours or overnight until thoroughly chilled. Remove cloves and cinnamon stick with a spoon. Serve over ice, garnished with a slice of lemon or orange.